This is a really interesting piece of Jaguar history. Jaguar introduced the XJS in 1976. It replaced the E-type in Jaguar's line up. It was a completely different type of car than the E-type and was not well received by many Jaguar, especially E-type, fans. To make matters worse, the E-type had been available as a roadster and the XJS was only available as a hardtop. In 1983 Jaguar sort of addressed that issue with the Cabriolet version of the XJS. It was not a full convertible. It had a targa type top, with a fixed body bar in the middle and a fold down canvass back. The window frames remained in place. Personally, this is my favorite XJS, but most people wanted a true convertible. In 1986 Jaguar contracted the Ohio based Hess & Eisenhardt coachbuilding firm to build a full XJS convertible. This was not a quick chop job. According to a Jaguar website, in order to accommodate the full convertible design, "the Hess & Eisenhardt convertibles have two separate fuel tanks, positioned to allow for the roof to fully retract. The process of converting the stock Jaguar XJS Coupe into the H&E Convertible included the post-production removal of the roof, cutting the body in several sections, the addition of steel reinforcements behind the driver's seat, and 20 lb (9.1 kg) weights placed just behind the headlights to eliminate harmonic resonance caused by the significant modifications to the car. H&E XJS convertibles are identified by two small badges located just behind the front wheels." The H&E Jaguars were built between 1986 and 1988. Jaguar introduced its own convertible in 1989. The exact number of cars built doesn't seem to be known as a fire at the H&E factory destroyed most of the records. Some websites say 2000 cars were built, other say just around 900. 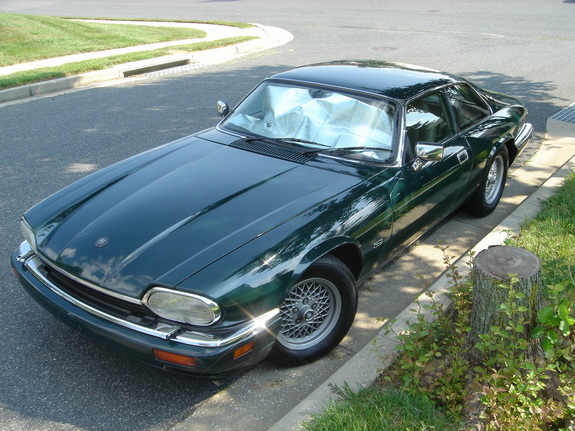 The H&E XJS was available by special order through US Jaguar dealers. With the top up, the H&E convertible looks remarkably like the later Jaguar produced convertible. With the top down, the H&E convertible looks a bit sleeker. This is due to the fact the the H&E car used an unpadded top that was able to fold completely into the body. When the time comes for me to buy a new toy, the XJS is on the Top 10 list of cars I'll look at. As I said, I like the cabriolet version. Most people would probably prefer the Jaguar built convertible. A Jag aficionado though, might want to look at this car. It's a nice piece of Jaguar history. Located in Stroudsburg, Pennsylvania, click here to see the eBay listing for this H&E Jaguar. Click here to read the history of Hess & Eisenhardt. It's pretty fascinating reading, at least if you're a car geek. I love XJS Jaguars, even owned a 1988 model myself (coupe) and the convertibles are commanding serious money nowadays. Styling on release caused a big old stir, but as with all Jags, they age very well and the XJS is no exception. However, with my own experience, I'd go for a later model with the straight six, far easier to maintain and a lot less problems than the V12. I have to chime in on this one. I drove a '94 straight-6 coupe in British Racing Green to college every day, which I bought for the wrong reasons, and I loved that car like crazy. Later on I spent almost 2 years on a quest to find a '95 V12 coupe, one of supposedly 50 in the USA for that final year (in 96 they imported 6-cyl cars only), and it had to be Green. I finally found my car, a mint one-owner deal with super-low miles from the Southwest. I had it shipped in, and, while I was head over heels for the car, it wasn't as fun as the 4.0 (maybe at the time my inexperience made that car seem better). I ended up not driving it all that much. That V12 car was the last car that I've sold, last Spring. I'd definitely get another one, maybe a 5-speed straight-6 next time. I just love these cars. The lines are perfect, it's big but it can dance. They're not too tough to spruce up with some grown-up performance mods, either. Some people make wise cracks about them being junk, but the later ones (93-96) are rock solid cars. The 4.0 (AJ6 & AJ16) and 6.0 engines were very well built, and the cars were nowhere near as worrisome as earlier Jags OR later Jags like the XK8 and XJ8. I'm not knocking the H&E, it's a super stylish car, but I have yet to have the pleasure to drive a pre-facelift car. Here are some pics, the '94 car and the '95. Those are both beautiful cars. Thanks for sharing them! I also have and love the '88 H&E I have. Hey all thought I's chime in on this one, I have the 88 xjs v12 Hess... and I am in love with her. There is nothing like crusing down the highway with the top down and everyone looking to see what you have. The drive is smooth and sleek, I have completely rebuilt mine, engine and body, back to original... I will drive her often and never sell. There is something special about the lines of this car. It's a piece of art, when H&E cut the tank, and hid the top with down, it changed everything in looks. An absolute beautiful car. My brother-in-law Lowell Enyart live in on the designing of the new convertible for H&E. I remember the day that they delivered one to the house in Blue Ash and he and my husband took it driving for a day. A beautiful red convertible. The next morning they came back put the convertible on a lowboy and took it to the Ohio transportation divisions test track. It was there that they test crashed the vehicle to make sure it could withstand certain crashes. I know it had to be done but boy that was too sweet of a ride to crash. The results not too pleased the company because not too long after that the Jaguar convertible was introduced to the market. I worked at Jaguar Cars at that time and can tell you the number of H&Es produced from '86 - '88 was closer to 2,000. Also - as someone who worked there .... an H&E XJS is probably the LAST Jaguar I would purchase if I were in the market for another one. Anonymous, does that mean, it was a great car and they don't produce good ones like that anymore, or it was a piece of crap , and you wouldn't ever consider it.??? I own a 1988 Hess/XJS with 38000 miles on it. Had the fuel rack rebuilt and installed a HD aluminum drop-in radiator right after I bought it used. Engine fires and overheating kill these cars. Address those two issues and they are head-turners and stone-cold reliable. Love the stares and thumbs-up I get whenever i take it for a ride.